Today NASA held a teleconference on the current status of Mars Exploration Rover Opportunity and its new mission. Opportunity has traveled much further, and lasted much longer than anyone could have hoped (see below for its path). Its original mission was to last about three months, but it has lasted more than 30 times longer. Mars Exploration Rover Opportunity's path is marked in yellow. The path is marked with numbers which represent the sol when Opportunity was at the labeled location. The Mars rover recently reached Endeavour Crater, which Mars Reconnaissance Orbiter's HiRISE and CRISM cameras determined has clay minerals along the rim that are of different from any previously examined by Mars rovers. In recent days Opportunity has been examining Tisdale-2, a rock unlike any ever encountered by a Mars rover. The rock has an extremely high concentration of of zinc, sulfur, and chlorine, all minerals that are found in large abundance when an area has experienced hydro-thermal activity. This increases speculation that there was once standing water on Mars. It is thought that this water could have been heated by the impact of the meteorite that created Endeavour Crater. While Tisdale-2 is a fascinating rock and unique to those found on Mars, it pales in comparison to the findings that await in Cape York where clay minerals with low-acidity have been detected. 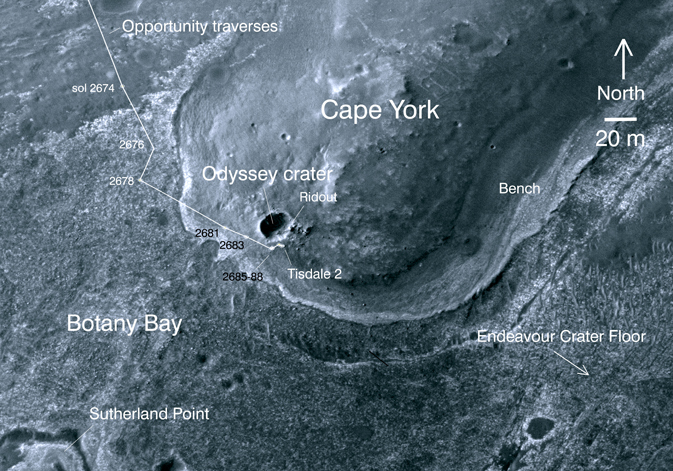 See below for a map that shows Cape York in comparison to where Mars Exploration Rover Opportunity's current location. Opportunity has been examining Tisdale-2, but is now heading to Cape York.